How tough is it to win the Champions League? So tough that since the competition's format was changed in 1991, no team has won the trophy in consecutive years. You may know that the last club to successfully defend its title was AC Milan, and that was a side which had some world class players in its ranks. I am talking about guys like Paolo Maldini, Franco Baresi, Ruud Gullit and Marco Van Basten among others. 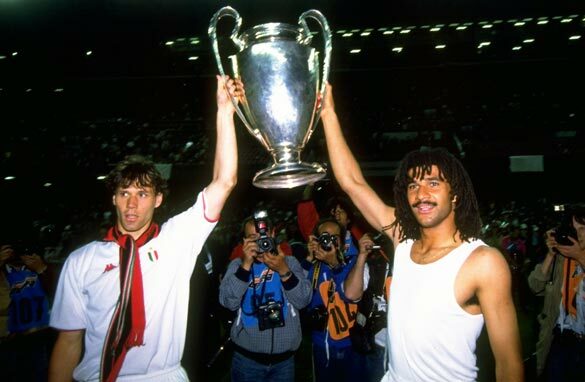 As I prepare to interview Gullit on the CNN FC show this week, I decided to take a closer look at all the challenges clubs face in winning the competition these days, and I will tell you what, I don’t think any club will win back-to-back titles any time soon. The modern Champions League is a lot tougher to win than the old European Cup. Why? The new format is obviously one of the reasons. With so many clubs from the highest-ranked nations in the group phase draw, the odds are high that contenders will have to face each other early in the competition. Just look at what happened in Group D this season. We had Real Madrid, Borrussia Dortmund, Ajax and Manchester City battling for two qualifying spots for the knock-out stages. You compare that situation with what happened two or three decades ago, and you can see the difference very clearly. The Milan side which won back-to-back titles faced the likes of HJK Helsinki of Finland and Vitosha of Bulgaria in the first round, beating them on aggregate 5-0 and 7-2 respectively. The other reason I believe no team will be able to win consecutive Champions League trophies is the competition you have out there right now. There are so many big clubs with big money who can become contenders almost overnight. Look at Chelsea, look at Paris Saint-Germain, look at Zenit St. Petersburg. These are just three teams who paid top dollar for top talent and went from being pretenders to contenders in the blink of an eye. If we have a quick look at what could be heading our way in the future, we see that the likes of Monaco in France and Anzhi Makhachkala in Russia now have spending power which could seem them join the Champions League ranks very quickly. Again, this is a completely different landscape to the one we had in the old European Cup. Every year, you had four or five favorites and perhaps four or five underdogs. That was it. It was quite uncommon to see teams come out of nowhere to become contenders from one day to the next. And if they did it, then it was because they developed slowly into a solid unit, not because they suddenly acquired talent. Finally, I believe there are a lot more quality players to choose from now than there were in the old days. Football is a truly global sport and the Champions League is a truly global competition. According to UEFA, there were 68 nationalities represented in last season’s Champions League and do you know what country had the third most representatives? Brazil. That never would have happened three or four decades ago. There were fewer talented players to recruit, they were mostly from Europe, and they went to the select few clubs who could afford them. So you know what? AC Milan’s achievement as the last club to win consecutive trophies is going to last for a while. I agree with all of that but as a consequence of the huge financial incentive of Champions League progress, domestic cup competitions suffer in terms of quality of football and prestige. It's crazy that even the current Barca, arguably the most dominant force post-1991, has also so far failed to win the trophy twice... Why? It is not impossible. It is just becoming difficult than before which is good for the competitiveness of the game. It is not impossible. It's just difficult which is good for the game. If individual country league can be that competitive, football will be awesome. I am tired of a league with one team winning the league titles for 20 times. This seems like a pretty simplistic argument – "won't happen again in a while?" Not a very definitive description. The basis for the argument seems valid – but is this not a "keen eye for the obvious" scenario? Are you suggesting that something needs to change to make it easier to win back to back titles? I struggle to see the purpose of the article other than to point out something football fans already know.. I would create a true European league from the top teams in Europe and then return either the champions league or UEFA cup into the knock out cup competition it was meant to be. Winning UCL is getting harder by the season.Teams are getting stronger and wealthier.Competition to win is like never before. I agree, especially because it explains how overrated a team like Real Madrid is. True, they won 9 European Cups but how many of them were in Champions League format? UCL is obviously hard to win since teams are getting more resourced with world class managers and players. it is really a competition of champions. Big players with big clubs that offer big money may not always be enough to win big trophies. Loyalty of the footballers to the fans, clubs, fellow footballers in the team are important if players dream of marching to the podium and get the cherished winner's medal round their necks.